This Bath Ballistic is also alot smaller than your average bath bomb, around the same size as the So White. This one looks really pretty & i picked this up because 2 of the girls in there (who by the way, all get a massive box full to the brim of all the new stock to try and out...lucky) had said it was their favourite. When you smell this, is does smell really christmassy, unlike So White which, lets face it, is more of a summery scent. 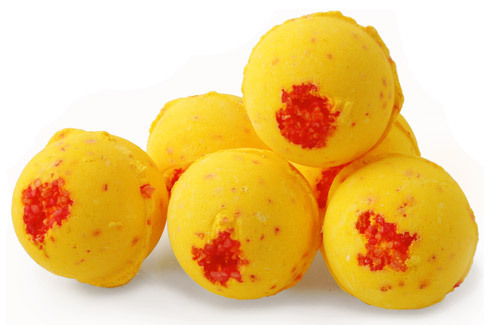 Lush describes it as a Spicy, Soda scented Ballistic. Lush also claim that when you pop this in your bath, it fizzes and crackles as it has popping candy in it. Unfortunately, and very dissapointingly, nothing was popping or crackling. No snap, crackle or pop for me though. Mine may well have been a dud, has anybody purchased this bath ballistic and heard crackling and popping? I can live without the noises if im honest, that wasn't why i bought it, i really do love the autumny smell, and it really was a very powerful scent even after the Ballistic had fizzed away. Overall, i think if you're after a genuinely nice, christmassy smelling bath product, this would be perfect. It did get me a little bit excited for christmas, just like apple and cinnamon candles do!